Text was changed from "Use: Throw rock to a friendly target..." to "Use: Throw rock to a friendly player..."
Warning: Do NOT throw this to a player if they have no free back space, i repeat: Do not throw it! It's all fun and games until someone loses some teeth. I like throwing these things at people who are AFK. It's a fairly obscure item from a dungeon that's not run much anymore, so most have no idea what they are or where they came from. I rarely stick around to see my victims' reactions, but when I do it's always bewilderment. Sadly, few of them get the reference. In 2.4 it was made no longer Unique(4). Perfect for throwing to your guildmate at a Vashj pull, right after they had to make bag space for a core. This is a reference to a classic (1990ish) Saturday Night Live commercial skit for "Happy Fun Ball" - view the skit here. I wouldn't have remembered that reference on my own, but i do remember seeing the episode. Good times. You actually can throw these to people of the opposite faction if you have a priest Mind Control them and then toss it at them. 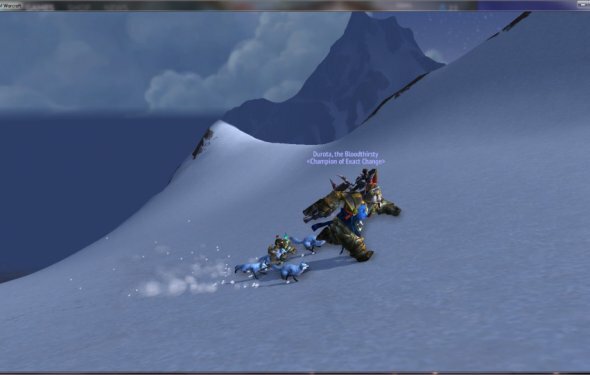 It was rather amusing actually tossing it between horde and alliance outside Shat one night. Interesting but often overlooked fact, this item only stacks to 4, not 5 or 10 or 20 as you might have expected. Let's have a super happy phun thyme! But only toss it to close friends if you hope to ever get it thrown back, goes for 400g on my server. Not as fun playing this drunk in Saudi Arabia. does anybody here actually have a working link, that works now? and works for people in UK/great britan? * The elderly and children under 10 should avoid prolonged exposure to Happy Fun Rock. * Caution: Happy Fun Rock may suddenly accelerate to dangerous speeds. * Happy Fun Rock contains a liquid core, which, if exposed due to rupture, should not be touched, inhaled, or looked at. * Do not use Happy Fun Rock on concrete. * If Happy Fun Rock begins to smoke, get away immediately. Seek shelter and cover head. * Happy Fun Rock may stick to certain types of skin. * When not in use, Happy Fun Rock should be returned to its special container and kept under refrigeration. * Ingredients of Happy Fun Rock include an unknown glowing green substance which fell to Azeroth, presumably from the Outlands. * Happy Fun Rock has been shipped to our troops in Elwynn Forest and is being dropped by our wyverns on Stormwind. * Do not taunt Happy Fun Rock. * Happy Fun Rock comes with a soulbound warranty. Happy Fun Rock. Accept No Substitutes! Side affects may include, but are not limited to: Burning, itching, bleeding, invisibility, and becoming a furbolg. Note: No longer droppable, do not suggest throwing it as these are now rather rare and sell for quite a penny on the Auction House. Happy fun rock meal, full of rocky goodness! For a minuit there, i thought a safety inspector had posted that review! Going for 7.5k on mine right now. This happy rock stacks to 4 instead of 5 or 10 like the majority of other stackable items, kind of odd. This is one of those fun things that my guild does. We go into ally cities and play tag. Warning! Do NOT throw Happy Fun Rock inside glass house, windows, or anything else considered fragile. Do not throw at face. If Happy Fun Rock comes in contact with eyes, seek medical help immediately. Note well if you're on a carebear server: Throwing this at a player who is flagged for PvP will flag you for PvP. It's happy and funnier than your average rock or stone. Hi! I'm Troy McClure, aka Lionel Hutz, aka Miguel Sanchez, aka Dr. Nguyen Van Falk. I had two of these on my Death Knight some how and I put one on the auction house for 97k. It sold and I came to a really frustrated realization that auctioneer had set the bid price to 1s. Fellow Happy Fun Rock farmers: this item used to drop from the ogres outside of Dire Maul, but now drop only inside of Dire Maul North. Don't be like me and waste time killing the ones outside the instance!